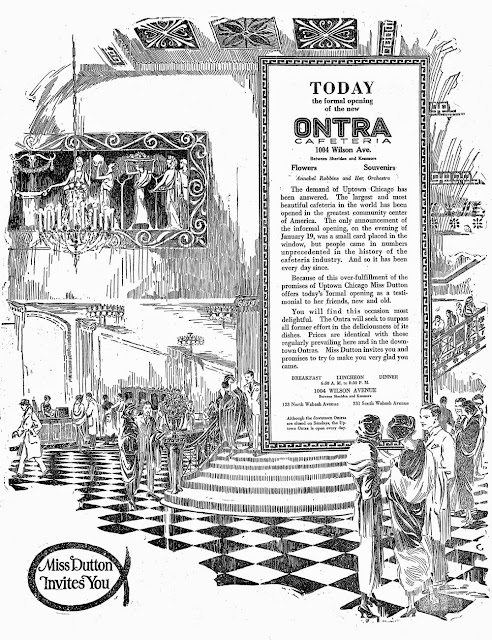 The Digital Research Library of Illinois History Journal™: The Ontra Cafeteria of Chicago, Illinois. The Ontra Cafeteria chain was started in downtown Chicago in 1909 by Miss Mary L. Dutton, self-described as "a woman past fifty." Dutton's first cafeteria at 123 North Wabash Avenue in Chicago which had a seating capacity of only 96 people. She started with only $1,000 of capital. Mary Dutton and her sister, Mrs. Jane Dutton Le Gurgy, opened a second cafeteria at 231 South Wabash Avenue. Operating two large cafeterias in the heart of the Chicago's business district required the services of several chef's in each restaurant. Fearing that food preparations bought wholesale would become less palatable and less important to the chefs to prepare properly. 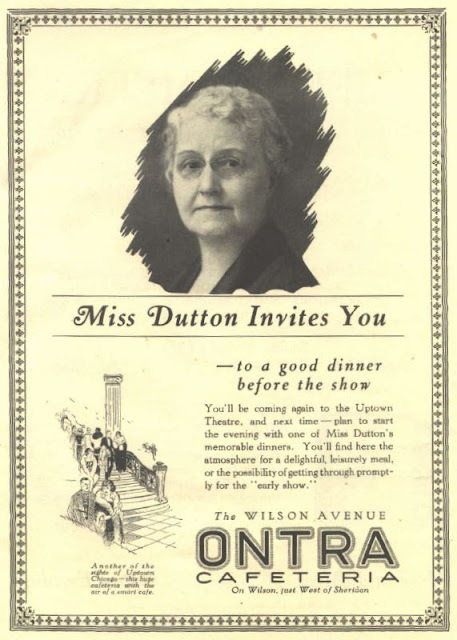 Dutton had not forgotten her reputation as a cook, and she made daily rounds of the kitchens, offering suggestions here and there, sampling foods, and even doing a great deal of experimental cooking. She believed that keeping her hand in things, she can keep the dishes up to the "home cooking standard." The average check was 42¢. Dutton ran her own bakery in the cafeteria and refused to put thickening into the pie fillings. "Let's keep away from it and make apple pies in the good-old fashioned way. Just use the apples themselves." Miss Dutton was everywhere in the cafeteria during mealtimes. Often this woman, who was worth more than a half a million dollars, may be seen picking up dishes of those who have eaten and gone. Although she retained the two Loop locations during the early 1920s, Dutton opened one of the largest cafeterias in America, seating 1,226, not in the Loop but in the booming Uptown community. The Wilson Avenue Ontra Cafeteria. The new Ontra was a $150,000 two-story concrete building with foundations for two additional stories later on, was erected on the 100 x 100 foot vacant lot back of the three-story building on the corner. The main dining room was 25 feet high with a long balcony on two sides.There was a 30 x 60 foot lobby with a fountain and ornamental pool with lounges and deep easy chairs. Her business was in a logical location because it served the needs of those living in over ninety apartment hotels, as well as hundreds of leased-space apartment buildings. 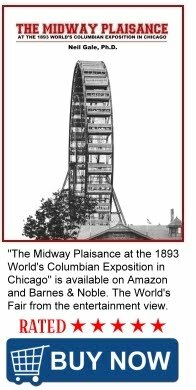 Most of the 400,000 Uptown-area residents were singles or childless couples who worked during the day, frequented the theaters, clubs, and dance halls at night, and took the majority of their meals outside of their living quarters. The Ontra Cafeterias feed over 8000 workers "JUST LIKE HOME" food a day. By 1956 Thompson’s Restaurants operated Ontra Cafeterias.